Ciao'd under the Super Blue Blood Moon. The Meyer lemon love fest continues. Last week, I posted a recipe for Chicken Soup with Orzo and Meyer Lemon. It was one of my most popular recipes to date. I'm not surprised because the recipe is super simple, freshly flavorful and healthy all at once. Plus, there's that radiant Meyer lemon sweet-sour kick. My Meyer lemon trees continue to bestow me with brilliant, sunshine-y yellow gifts. It's a banner year. These magical little lemons deserve a place in the ciaodonata sun. 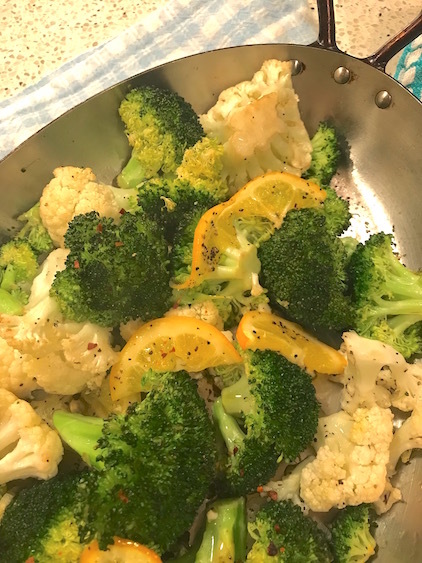 So, herewith, a super simple yet sumptuous recipe for Meyer Lemony Roasted Broccoli and Cauliflower. #dolcevitadelish. Enjoy! Preheat an oven to 475 degress. Place the broccoli and cauliflower on a rimmed baking sheet and toss with the oil, garlic, and lemon slices. Roast until the vegetables are browned and tender, about 30 minutes. Toss the vegetables halfway through. Serve immediately.